Saar versus Mosel. Mineral versus Fruit. Acid versus Acid. Versus, versus and versus. Three time versuses are in the title of my tasting note today. Both wines are from my favourite wineries from the Mosel, Saar and Ruwer area, now, of course, the three melt into just one Mosel area. The first one is since long one of my favourite; the second one, I just felt in love with only recently. One dominated by mineral, the other by fruit. One full and complex, the other light and refreshing. Versus implies competition but both wines today imply what a German Riesling does best; to truly and beautifully reflect the terroir, the interpretation of the soil and one year climate in a bottle. Nose: very charming nose dominated by salty, nutty mineral with hint of spices. Aromas of riped fruit, apricot, orange and grapefruit, with subtle delicate floral scent. Very aromatic and complex with irresistable mineral tone. Mouth: Luscious mineral with delicious fruit. The flavour is very complex and full. The acid is stunning; yet the wine is harmony due to a little bit of rest sugar. Great play and balance between sweetness and sourness. The texture is very yummy; round, full and creamy. Middle body. The finish is long with good mineral and, again, with great acid. This is a really tasty and complex wine with intense mineral. The wine develops more and more after the cork is popped out. The sharp acid, typical Saar acid, is balanced out by a little bit of sweetness. This is actually the noticeable feature of the wines from Roman Niewodniczanski. This vineyard has a very long history and was in the old time a monastery winery. It was then run by the four generations of the family Van Volxem before it was bought by Peter Jordan in 1993, who operates the vineyard under the name of Jordan & Jordan. In the year 1999, Roman, a great-great grandson of the founder of one of the biggest beer empire in Gemany, the Bitburger, bought it and revitalize the vineyard towards its former fame under its old name. 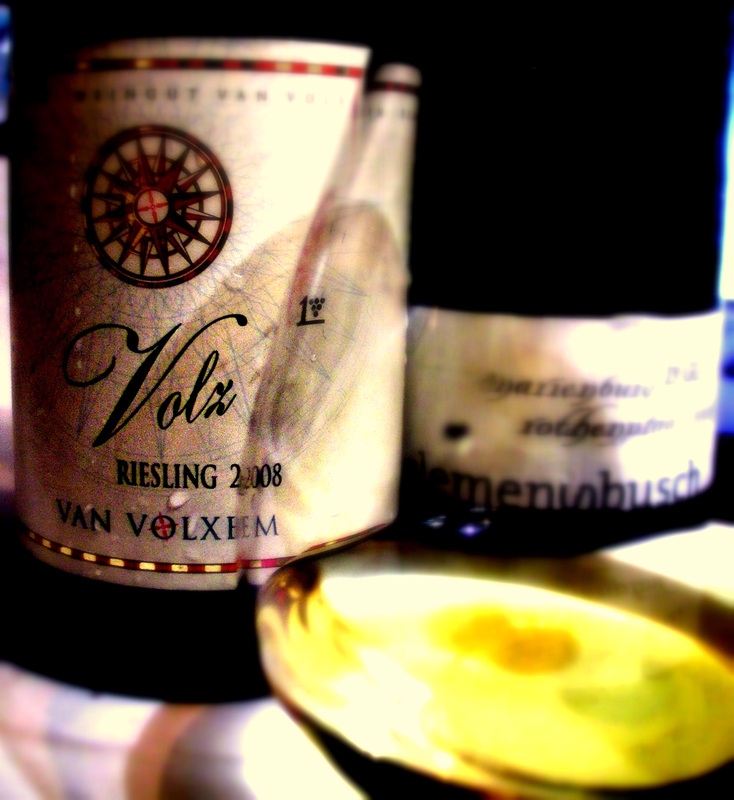 Volx Riesling comes from a parcel that was, according to the Preußischen Lagenklassifikation from 1868, classified as a Grand Cru site. The soil is dominated by blue slate planted with vines that are over 60 years old. Nose: light fresh fruity nose; lemon and lynches. Subtle honey floral scent with a little bit of jasmin. Spicy cool slate-ty tone. Very refreshing. Mouth: fruity taste with mouth watery acid with a bit of mineral in the background. Smooth soft light texture. The finish is long with delicate fruit and yummy acid. This wine is really refreshing. Close your eye while drinking it and you emerge directly in the middle of a grass field, inhaling the beautiful and fresh summer breeze. The vineyard is located in Puenderich in the middle Mosel area. The Rothenpfad comes from a parcel in the Marienburg site dominated by red slate, resulting in a wine with a spicy mineral tone. Clemens Busch is famous for his sweet wines. One Auslese from 2006 and one Trockenbeerenauslese from 2007 is the regarded by Gault Millau as wine of the year. I have had very little experience with his wines but, from now on, I will not waste my time anymore.